Standing in the shadow of the grandiose Richardsonian Romanesque style Thompson House, it is impossible to feel anything short of awe. This exquisite structure, designed in the 19th Century by Cobb & Frost for attorney John H Thompson, evokes a time of true masterpiece that is unparalleled in today's market. Lovingly & painstakingly restored, this nationally registered Historic Landmark is one of the most iconic homes in Chicago's highly sought after Gold Coast. Its enviable location provides gorgeous views of Washington square, making it just steps away from Lake Michigan & a short walk to Chicago Mag Miles. Inside this timeless home you'll be met with the efficiency of 21st Century technology complemented by high quality craftsmanship: custom millwork, silk wall-coverings, marble floors, stained glass windows, rich wood paneling, Mahogany h/w floors.. Experience true gentility and sophistication & own a piece of Chicago history with a property that was built to enchant for centuries. Completely custom half floor residence at the Ritz Carlton Residences. Elegant high floor with sweeping south, east, and west views of the city from the terrace off of a lavish and spacious living room. Adjoining dinning room and den offer an exceptional space for entertaining while enjoying panoramic views of the city. De Guilio kitchen features a 6 burner dual oven Wolf Range, Miele Dishwasher, and two subzero refrigerators. The den has custom built ins with a subzero wine cooler and ice maker. A Creston system controls the audio, visual, and lighting throughout the home. There is nothing else like it in the building! Incredible opportunity to own an historic 10,000+ SQFT SF residence on an oversized dbl lot on 1 of the most desirable blocks of Astor St. Constructed in 1892, this home retains its orig architectural details, incl an exquisitely detailed Gothic fireplace crafted of cast limestone, walnut paneling, cast bronze sconces & leaded glass wndws in the great rm & a banquet size DR, great for entertaining. A graciously curved walnut staircase extends from the generously sized limestone foyer to the 2nd level & mstr ste. The gourmet kit is flooded w/sunlight from the oversized copper skylight & has been updated for modern living w/chef's grade appl, eat-in space, FPLC & French doors overlooking the rear garden. Unique to this home is a gated drive extending from Astor Street to the 4-car gar w/1 BR, 1 BA coach house above; ideal for an in-law arrangement, studio, or office. This meticulously maintained home is steps from the beach & conveniently close to restaurants, shopping & several parks. Located on an extraordinary double lot in the heart of Chicago's Gold Coast, this 9,100 sqft mansion offers the best of all worlds! Original handcrafted architectural details have been preserved while it was transformed by LG Development into a comfortable 21st century home with state-of-the-art infrastructure and a modern floorplan designed for entertaining and family living. There are 7 bedrooms (including a luxurious full floor master with opulent bath & dressing rooms) plus a guest suite in the coach house. The home's lower level was excavated and transformed into additional recreation space including a theater, game room and more. The 3-car garage is connected to the house via a large mudroom and has a 1,250 sqft apartment above. The private landscaped side yard is ideal for entertaining and recreation, while the driveway offers additional guest parking. This home is conveniently close to the city's finest schools, as well as restaurants, shopping, parks & the lakefront! Bloomfield Development presents an ultra-rare, new construction, 7,400-square-foot single-family home in the heart of the famed Gold Coast neighborhood. 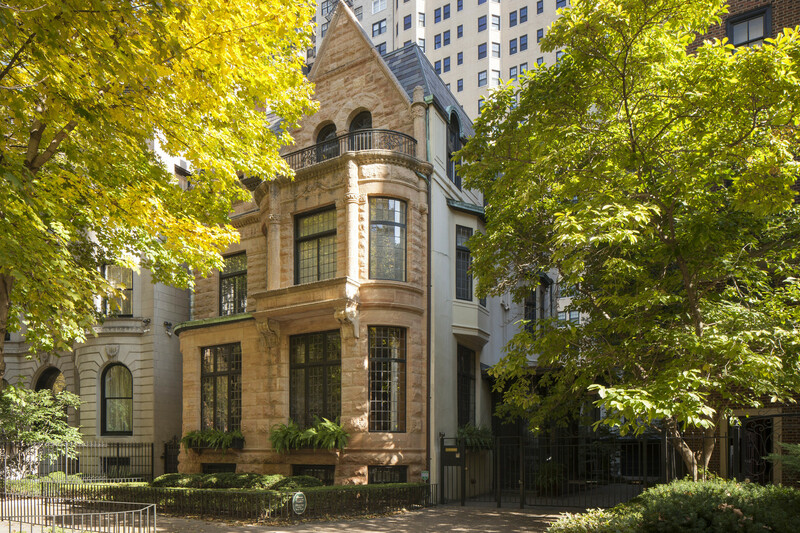 Located on an oversized 150' deep parcel on one of Chicago's most prestigious streets, this classic home features a French limestone facade, 6 bedrooms, 6 full baths, 2 half baths, a 5-stop elevator, and a garage for up to 4 cars (with optional lift). Enter through the elegant entry hall in the front, or through the large mudroom in the back. Expansive main level features paneled living room, spacious dining room with adjacent wet bar, and unbelievable kitchen/great room with gorgeous windows & sunlight. Tremendous ceiling heights throughout. The master suite includes a separate sitting room with fireplace, dressing area and enormous walk-in closets. Additional bedroom/den on master level. Three secondary bedrooms plus additional study on top floor. Huge media room with bar & wine cellar in lower level. Rear yard + 2 rooftop terraces! Enjoy expansive lake and city views from the living, dining, and family rooms - 60 feet of lake frontage - exquisitely renovated and ready for move-in. Approx 7055 sqft home that duplexed down with 4 bedrooms, 5.1 baths. White oak hdwd flrs thruout. Australian olivewood paneling. E/i kitchen w/pietra cardosa ctrs, arclinea cabinetry, miele, wolf, subzero appls. 1800 bottle temp controlled wine room. Master ste w/sunny south-facing views, his/her baths, custom dressing room, separate closets. 3 addtl bedrooms w/baths ensuite + custom closets. Study w/glass door entry, australian olivewood cabinets. Systems: retractable power shades, recessed lighting, control 4 operation system, 12 touchscreens, new windows + mech systems, humidity system. Interior walls sound insulated. Transferrable leased parking for 2 cars w/daily car washes @ $425/mo/car. Cash only co-op.